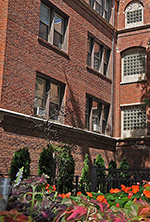 Check out these apartments with classic vintage character in southeast Lakeview! This one of a kind, 1920 three story walk up sits on the corner of Sheridan and Barry one block from Diversey Avenue golf driving range, jogging trails, and lakefront. Each unit offers high ceilings, unique floor plans, and vintage molding, making Sheridan/Barry a must see for residents who want a living space with character.